This is the first post in the Noise Monitoring blog series. A gurney rolls across a tiled floor. A patient monitoring system screams an alarm, summoning an attendant nurse. In the hallway, in front of a sign which reads “Quiet Please” in large letters, a visitor talks on a cell phone, and a doctor and a nurse chat casually. All of these sounds are part of the hospital soundscape– a swirl of noises which has been growing louder and louder in recent years. According to a study done by researchers at the University of Chicago, hospital noise levels at night, on average, sit between 50 and 80 decibels– about as loud as your average chainsaw. That’s definitely louder than the WHO’s recommendation of a cap of 30 decibels at night. In some staff areas, noise levels can reach a stunning 90 decibels; these sounds can filter out of those areas, down echoing corridors, and into patient rooms. 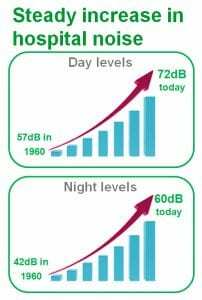 So why the rise in noise? Simply put, it’s because there are a lot of circumstances in hospitals which create it. Some of those are direct results of the medical care which is the hospital’s function. Technology certainly plays a major part; medical monitoring machines hum and beep, and have loud alarms which alert doctors and nurses when something goes wrong. In the hallways, carts and gurneys roll along the floors, delivering food, medication, and patients to the locations where they’re needed— and creating noise along the way. Some of the sources of noise aren’t directly connected to medical care, but are inextricable parts of the environment anyway. Entertainment systems, particularly televisions, are common features in patient rooms, an expected part of the hospital landscape, and a major contributor to the cacophony. A steady flow of people also creates sound; visitors talk on cell phones or to doctors, doctors and nurses talk to each other, and all these conversations combine to add to the overall decibel level. Finally, the problems of noise are exacerbated by other, more unchangeable environmental factors. The physical features of hospitals are designed in a way which amplifies sound. It’s pretty rare to see carpet– instead, floors and walls are usually made of tile, laminate, or other hard surfaces, which reflect and bounce sound instead of muffling it. And although patients sleep, hospitals don’t. They have to operate twenty-four hours a day, seven days a week, and 365 days a year, and round-the-clock arrivals and activities mean round-the-clock noise. This rise in hospital noise hasn’t slipped under patients’ radar. Research presented in 2011 shows that according to the HCAHPS survey, 42% of patients were dissatisfied with noise levels in hospitals, and that most of these complaints were directed at noisemakers inside patient rooms: alarms, medical equipment, and talking were all cited as contributors to this sound. These numbers suggest low levels of patient satisfaction with the hospital environment, and illustrate in part why noise levels in hospitals are a problem which needs to be addressed. 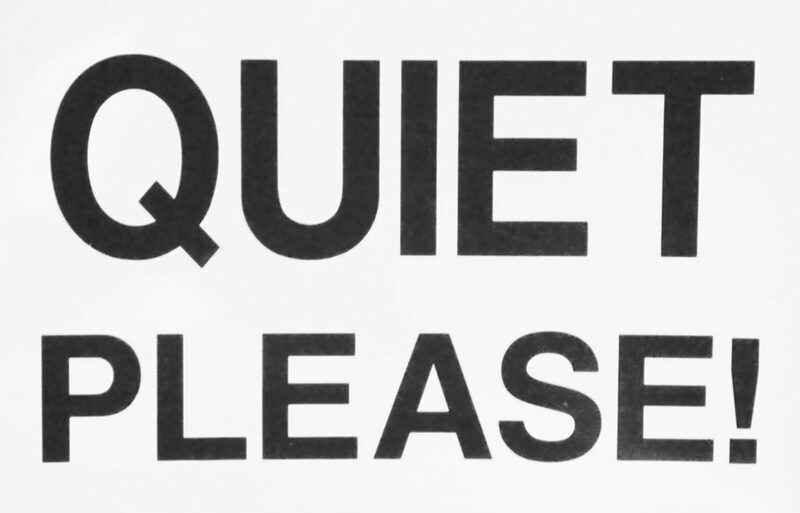 With noise levels doing nothing but rising, hospital management should turn their attention toward working on creating in reality the environment that those “Quiet Please” signs advocate in theory, through comprehensive and effective noise monitoring solutions. 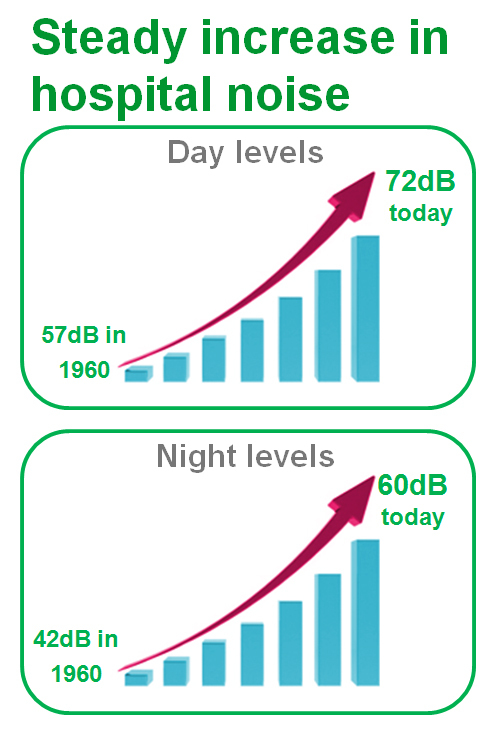 Read more about trends in rising hospital noise in our white paper! Have you noticed increased noise in hospitals? Tell us about your experiences in the comments below!